Breathing is a fundamental function that every human needs to survive. Without a properly functioning pulmonary system, breathing can be very difficult. There are ongoing pulmonary clinical trials to study new ways of better diagnosing and treating pulmonary disorders. If you have been diagnosed with a pulmonary disorder and are interested in participating in a pulmonary clinical trial, please review the list of current trials and contact us. Pulmonary refers to anything having to do with the lungs. In humans the lungs’ main function is to carry oxygen from the air to the blood and then release carbon dioxide into the atmosphere. Specialized cells form tiny air sacs called alveoli. Alveoli play an important role in this process. In humans there are two lungs located in the chest, on either side of the heart. Additional functions of the pulmonary system include filtering blood clots and protecting against air-borne infections. Pulmonology refers to the study of diseases that affect the lungs. Known causes of pulmonary disorders include heredity and exposure to toxins such as smoke and chemicals. A few of the ways that pulmonary disorders are diagnosed are through blood tests, chest x-rays, CT scans, and spirometry. Treating pulmonary disorders depends on the type and severity of the disorder. Medications are sometimes administered through inhalers for ailments such as asthma and chronic obstructive pulmonary disease (COPD). Pills may also be prescribed to treat pulmonary ailments. Oxygen therapy is sometimes needed to supplement the amount of oxygen getting to the blood. In more extreme cases patients might need the assistance of mechanical ventilation. 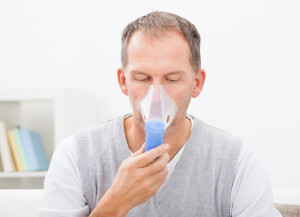 Respiratory therapy is prescribed as a last resort when other pulmonary treatments fail.